Fibonacci Expansion technical analysis tool is widely used by traders to find the areas where they wish to place their take profit. 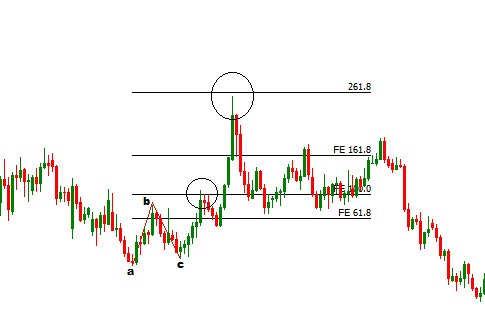 Fibonacci retracement tool is used to find support and resistance levels, and the levels are used for breakouts and range trading. With fibonacci expansion, the fibonacci level higher than 61.8% is considered. Fibonacci expansion not only used to find the profit target level rather it can used to find strong support and resistance levels to place orders. In following illustration a down trend is measured by the fibonacci expansion tool. To draw a fibonacci expansion tool, we need three points a, b and c.In other words to draw a fibonacci expansion tool we need two waves an original wave (ab) and a wave (bc) retracing the original wave. In the following illustration, we drawn a fibonacci expansion tool to measure a bearish trend. We can see two waves are used to draw the fibonacci expansion one is towards the trend and another one is against the trend. Similarly, we can draw fibonacci expansion tool to measure a up trend. From the above explanations, we can understand that the fibonacci levels represented by the expansion tool represent strong support and resistance levels. This tool can be very effective in placing orders at the support and resistance levels. 161.8% and 261.8% fibonacci retracement levels represent very strong support and resistance levels. Traders also use fibonacci expansion to place more than one profit targets at different fibonacci retracement levels e.g. 100%, 161.8% and 261.8%. This tool can be successfully applied to place profit target and to place new orders. 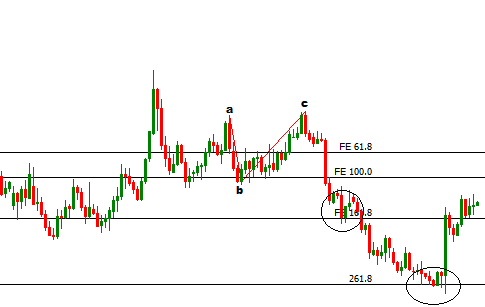 If you have any question regarding fibonacci expansion tool, you can drop a comment below.